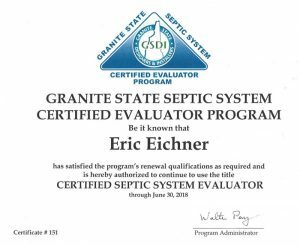 I just wanted to thank you for doing our septic evaluation. It was very educational, I didn't expect all of that! I know we picked the right guy when we got you, again thank you Eric. Eric, First off, thanks again so much for seeing it through last night. You two did an amazing job. I’m sure that wasn’t the average inspection. Between your report and the things we discussed I don’t think it will be a huge issue getting the system straightened out. Again, thank you for the hard work. Have a great weekend. We were actually at a camp ground in NH for the weekend, so just getting to respond to this now. Thank you so much for your time and attention to detail in this report and the inspection itself. And also for the education. Really appreciate it and have already recommended you to our friends in New Hampshire that have multiple properties in the Hinsdale / Keene areas. Thanks again and we’ll let you know after careful review if we have any questions, but the report seems clear and straight forward. Take care and wishing you continued success on your business.